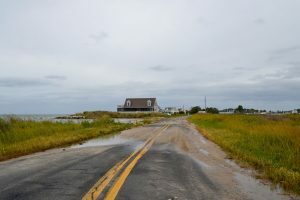 Dorchester County on Maryland’s Eastern Shore is one of the state’s most threatened coastal areas, where planning for large storms and related hazards has become critically important. With many of the County’s historic resources located in impacted zones, the urgency to document, analyze and communicate the impacts to those resources is critical for our local partners. 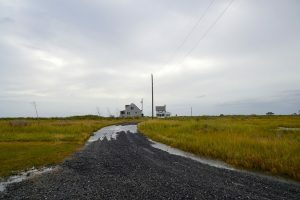 Preservation Maryland will assist our local partners with a grant-funded historic resource risk-assessment planning effort, as well as targeted community outreach on the findings and the design of a new user-friendly web resource on historic resource documentation, disaster planning, and mitigation. A landscape image in Dorchester County taken on an Underground Railroad Tour for Preservation Maryland's annual conference in 2010. The landscape at Anchor of Hope Cemetery. 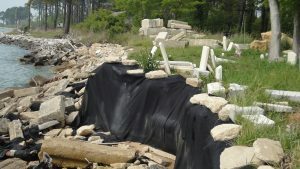 The cemetery has suffered from significant erosion. 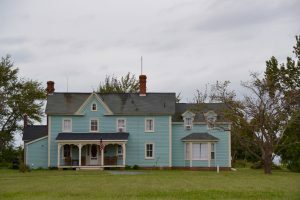 Dorchester County lies along the eastern shore of the Chesapeake Bay and has been home to watermen and farming communities since its settlement in the mid to late 17th century. Many agricultural and fishing traditions we recognize today have developed and adapted from life lived on the Chesapeake Bay and her tributaries. Dorchester County is one of the largest rural counties in Maryland with the longest distance of coastal shoreline, with over 1,700 miles of coastal shoreline consisting of the various waterways of the Chesapeake Bay, the Choptank River, the Nanticoke River, and countless tributaries. 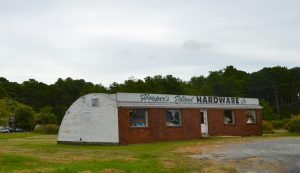 Dorchester County is steeped in history. It hosts a number of local, state, and nationally themed historical and cultural significant sites that relate to State Governors, Harriet Tubman, and many of our recognized icons such as skipjacks, buyboats, and lighthouses. Much of our recognized Chesapeake Bay heritage has roots in the boat builders and docks of Dorchester County. 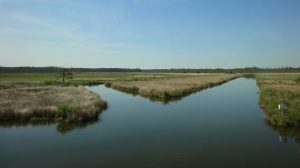 The County is also home to The Blackwater National Wildlife Refuge and which has recently been designated to be the site of a state and national park honoring Harriet Tubman. This site will share the story of national heroine Harriet Tubman, famous conductor of the Underground Railroad. 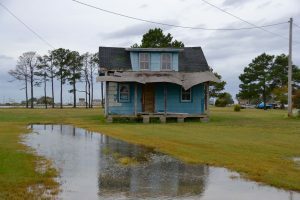 Dorchester County has a significant history of bearing the brunt of coastal storms. As a result of this threat, Dorchester County can be counted as one of the most impacted coastal area in Maryland and along the Atlantic Coast. 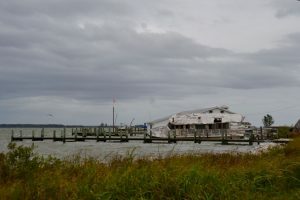 Planning for coastal storms and related hazards has become critical for Dorchester County. With many of the County’s historic resources being located in impacted zones, the urgency to document, analyze and communicate the impacts to those resources is critical for our local historic and cultural resource community partners. 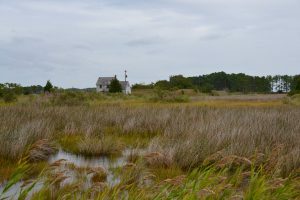 Some impacted resources include historic churches, working waterfront villages, sites of historic significance along the Harriet Tubman byway and the Chesapeake Country Byway, the Tubman National Park and State Park and habitat found within the Blackwater National Wildlife Refuge. The addendum on cultural resources to the Dorchester County Hazard Mitigation Plan 2017 update has been completed. This process studies the impact of flood hazard risk to Dorchester County’s historical and cultural resources. As part of their ongoing Weather It Together program, the Maryland Historical Trust has released, “Flood Mitigation Guide: Maryland’s Historic Buildings,” a comprehensive 350 page document detailing a plan for adapting to flooding and other issues related to climate change. The Maryland Historical Trust accepted the grant application co-written by the Heart of Chesapeake County Heritage Area and Preservation Maryland and the heritage area was awarded a $44,000 grant for hazard mitigation planning. This funding was made available to Maryland organizations through the National Park Service Hurricane Sandy Disaster Relief Fund. MHT awarded $247,000 to seven projects throughout Maryland in 2016. This grant will provide the necessary funding for the survey component of this project.